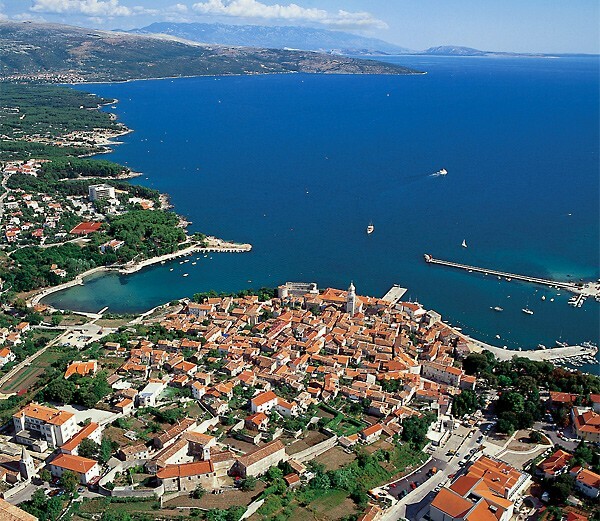 Krk, reached by a marvelous arched bridge (at one time, the largest in the world) driving from Rijeka, is big, beachy and filled with tourists—but outside the main towns of Krk and Baska, there are plenty of quieter places to find your fancy. With average temperatures of 22-23C and water temperature pretty much the same, Krk has become a hotspot for families who love the sun and surf. Surrounding Krk are some twenty little islands, islets, rocks and reefs. Best beaches? Punat Marina, Baška, the Ježavac auto camp, Lukobran, FKK Politin and Koralj. The Illyrian tribes arrived in the 7th century and the number seven pops up a lot here—there are seven castles on the island, seven administrative districts and seven varieties of the Chakavian dialect of Croatian used here. This creates a rich cultural palette of feasts and festivals, like the Summer Festival of Folk Traditions, the Sopile (an ancient wind instrument) Players of the Island of Krk Review, the Stomorina (part of the feast of the Assumption in Omišalj), the shepherds’ custom called razgon, on the first Sunday in July, in Vrbnik, and others. Besides enjoying the sun and surf, you can dive, explore caves, snorkel, go on night fishing trips and even get a curative mud treatment at Soline. Or take excursions to the islands of: Rab, Cres, Losinj, Grgur and Goli. It’s easy to get to here: drive over that fab bridge, fly into the Krk international airport from many European cities or take a ferry. –specific information on key towns, places to rent, etc.